Professional Formula F racing has ramped up throughout North America during the past month, with Honda-powered open-wheel racers competing in two Canada series, as well as in California and Connecticut in the U.S. The category continues to expand following the introduction of the Honda L15A7 Formula F engine in 2010. 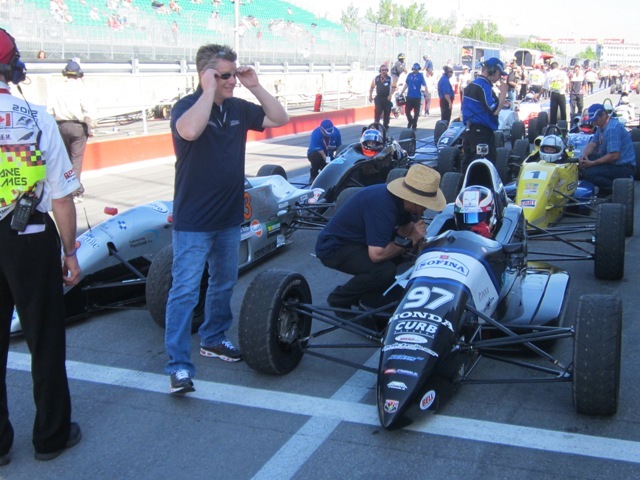 The Quebec-based Formula Tour 1600 made its traditional, featured stop at the Circuit Gilles Villeneuve in the center of Montreal for back-to-back race days in support of the June 8-10 Canadian Grand Prix. More than 30 Formula F drivers contributed to a pair of event-filled races on the Ile Notre Dame, with defending champion Nathan Blok and former series title-holder Olivier Bonnet splitting the victories. On Saturday, Bonnet took the win in his Vector Ford after Blok was penalized for passing under a yellow flag. Garrett Grist was second in his Bryan Herta Autosport Mygale Honda. On Sunday, Blok and Bonnet continued their intense duel. But in this race, it was Bonnet who was penalized for on-track misconduct, which resulted in Blok taking the win. Matt Di Leo, making a one-off appearance during a break from his Star Mazda program, finished second. Significant changes made to the Formula Tour 1600 series for 2012 include the addition of the Honda L15A7 Formula F engine alongside the traditional Kent power plant, and a switch to Toyo R888 tires for all competitors. The Quebec-based series opened its season in May with the first of three doubleheader race weekends at Le Circuit Mont Tremblant, where Blok and Xavier Coupal traded race victories and series rookie Jean-Philippe Jodoin made his Honda-powered Formula F debut with a third-place finish in Saturday’s race. The Formula Tour 1600 now returns to Mont Tremblant for Rounds 5-6 of the12-race championship on July 7-8. The series website can be found at http://www.siteformulatour1600.com/. In California, the Corsa Car Care Presents the Pacific Formula F Super Series held a pair of races at the 2.9-mile Auto Club Speedway road course in Fontana for Rounds 7-8 of the 12-race championship. Conner Ford and Ed Erlandson had another of their frequent battles for supremacy in Saturday’s race, with Ford’s Honda-powered Mygale edging Erlandson’s Swift-Kent by less than a second in the run to the checkers. Neil Roberts rounded out the top three finishers in his Swift DB-6 Honda. Sunday’s race featured another slipstreaming run from Turn 4 of the oval track to the finish, with Ethan Shippert taking the victory over Ford, while Erlandson recovered from an early-race spin to round out the top three finishers. With six victories this season, Ford holds a healthy lead in the drivers’ championship, with 250 points to 149 points for Erlandson. Piper Honda racer Sage Marie is third with 97 points, followed by Roberts with 64 points. Next up for the Pacific Formula F Super Series is the September 8-9 doubleheader weekend at Buttonwillow Raceway. More information on the series is available at www.pacificF2000.com. The Toyo Tires F1600 Championship – formerly known as the Ontario Formula Ford Championship – continued its 2012 season May 26-27 at Shannonville Raceway. 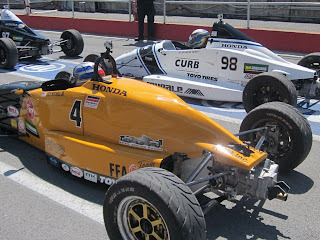 As in the Quebec-based Formula Tour 1600, Honda engines and spec Toyo tires are now included in the Toyo F1600 Championship, and the modern, fuel-injected 1.5-liter Honda is permitted to compete alongside the 1.6-liter overhead valve Kent engine. Veteran racers Steve Bamford and Caitlin Johnston are among the first to race the Honda in Canada, Bamford in a new Mygale and Johnston in her trusty Van Diemen chassis. At Shannonville, Michael Adams extended his championship lead with a perfect two wins from two starts, but neither was a runaway victory. On Saturday, both former series champion Shane Jantzi and Bamford supplied the pressure, while, just a bit further back, Johnston fought with impressive series rookie Jack Mitchell, Jr. Eventually, Adams pulled out a slight advantage to claim his second win of 2012, followed by Jantzi and Bamford. Mitchell finished fourth, just ahead of Johnston. On Sunday, Jantzi started from the pole, but Adams battled back and the pair exchanged the lead several times before Adams took the win to complete his clean sweep of the weekend. In a repeat performance from the previous day, Mitchell and Johnston renewed their battle – this time for third place – but once again, it was the rookie Mitchell coming out on top. After four of eight races, Adams leads the title fight with 388 points to 354 for Jantzi, with Honda-powered racers Bamford and Johnston third and fourth with 294 and 282 points, respectively. The Toyo F1600 championship resumes this weekend, June 22-24, at Canadian Tire Motorsports Park (formerly Mosport Park). More information can be found at http://www.offcseries.com/. Back in the eastern U.S., the F1600 Formula F Championship Series conducted its second race weekend of 2012 May 25-26 at Lime Rock Park in Connecticut. In Race 1, budding Formula F star Matias Koykka started from the pole and never looked back, leading all 30 laps to score his second win of the young season in his Cape Motorsports Spectrum Honda. It was a textbook perfect race for the 17-year-old Finnish karting graduate, as Koykka led every lap and set the fastest race lap en route to the victory over Brandon Newey’s Mygale Honda, with the Citation Honda of Jeremy Grenier rounding out the top three finishers. In Saturday’s second race of the weekend, it was Newey on top at the finish for his second victory of 2012. Newey, a 19-year-old Indianapolis native and Purdue University freshman, wheeled a Bryan Herta Autosport Mygale to first place at the checkers. As in the weekend opener, Newey and Koykka dueled throughout the opening laps in the 20-lap run. But this time, it was Newey’s car that proved stronger in the second half of the race as he eventually pulled away from Koykka, who ultimately dropped to ninth after contact with a lapped car. Grenier finished a career-best second, while Joe Colasacco rounded out the victory podium by virtue of a third-place finish in his Van Diemen Honda. After four of twelve races, Newey leads the championship with 181 points, followed by Grenier at 139 and Koykka with 137. The series continues with Rounds Five and Six, June 29-July 1 at New Jersey Motorsports Park. Additional information on the F1600 Formula F Championship Series can be found at http://www.f1600series.com/. 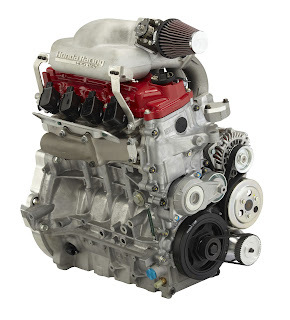 It’s a Honda Racing/HPD tradition: the red cam cover that signifies commitment to excellence and performance. Red cam covers have been found on Honda Racing Indy car engines since HPD began Championship Auto Racing Teams competition in 1994. Today, HPD employs red cam or valve covers on its entire line of racing engines, from pinnacle efforts in the IZOD IndyCar Series and World Endurance Championship to grassroots karting and club racing programs. As a “thank you” to Honda-powered Formula F racers, complimentary red cam covers have been shipped by Honda Performance Development to drivers and teams running the Honda L15A7 engine in North America. It is HPD’s aim to make the competition “see red” at every opportunity!